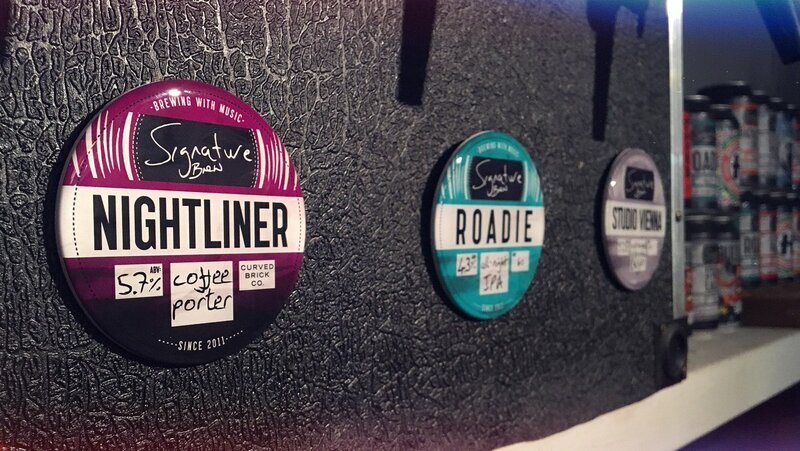 We're proud to announce our collaboration with Signature Brewery - Nightliner - a 5.7% Coffee Porter. Nightliner is being launched on Wednesday 1st March at The Leyton Star pub. Along with the beer being served on cask and keg local burger experts We Serve Humans will be creating a very special one off burger using the beer along with chilli and chocolate. The teams from Signature, Curved Brick and We Serve Humans will be there en masse to celebrate the three way collaboration and chat to excited drinkers in attendance. The beer is made with two Curved Brick coffees, Spectrum and 66 Clocks that were used in the mashing stage, whirlpool with the hops and a two phase cold infusion during conditioning to provide an abundance of intense, complex coffee notes in both the aroma and taste. The 15kg of coffee provide the focal point of the beer but drinkers can also expect hints of dark chocolate, forest fruits and a pleasing acidity. We're thrilled to have teamed up with our fantastic local milk round Parker Dairies to bring you a brand new Curved Brick Coffee "Electric Morning". We will be launching during January 2017, keep your eyes peeled for more details!